And better yet, it saws wonderfully. The old girl looks pretty good for being around a hundred years old. It took me a while to run the last leg of this race but yesterday I got my act together and finished the rehab. What took so long was my wait for a couple parts I used a local metalsmith to fabricate. The stock guides are L shaped braces that I wouldn't call vital, but they are damn handy. They sit in shallow dado's in the bed and clamp into place with a thumb screw clamp behind the fence. When you place the stock on the bed, you snug up the stock guide to support the piece in place against the back and forth friction of the saw stroke. Yes you could hold the stock with your hand, but that may be more difficult when dealing with crown mouldings. They make using the saw much nicer. I tried to fabricate these by myself couple of different ways. I bought the flat and round steel stock and first I tried to drill and tap the end of the steel bar for a machine screw. I tried to be careful and take my time, I drilled the appropriate hole and used oil to lubricate the process. Yet my tap broke off inside the steel bar. So I went to plan B. I had read another online account of a similar rehab where the author fabricated his using a two part epoxy. I picked some up and gave it a shot. Again I followed the instructions carefully but I couldn't get the epoxy to hold up to even light handling. I was doubtful about it, but it was worth a shot. One thing I don't have in my skill set that I would love to learn is welding. I cast around and found a local metal smith / artist who was willing to throw down a couple quick welds for me. After a few weeks I was able to stop and pick up the pieces. Now I was in business. The only metal fabrication part I had left was a top bar that connects the two towers and keeps them from racking while you're sawing. This was a simple piece of flat stock, (the same as I used for the stock guides) and it took me re-taping and replacing one of the thumb screws with a replacement. A couple of screws connected the saw box to a off-cut of 1x12 pine. Now I can cinch it to the bench with a couple holdfasts and store it underneath when I don't need it. All that was left was to sharpen the saw itself. I always kind of work myself up about before hand and when it's over I think, "Damn, that wasn't so bad." For certain it's not that difficult of a thing to learn, and the more I do it the better I've gotten. One of the turning points for me was taking a saw sharpening class with Mark Harrell over at Bad Axe Tool Works. I wrote about that experience HERE. Working with Mark taught me to trust my the feel of the file and the things my eyes were seeing and has let me do away with the guide blocks and jigs I'd been using up to this point. Knowing what to look for has improved my sharpening greatly. He's teaching more of these classes. As I understand it a couple times a year. Drop by his site and get in contact with him about dates and details. It's so worth it. Once I sharpened the teeth I used another piece of pine off-cut to test my work. Another trick I learned from Mark. I scribe a square line and saw it, burying the saw to the back. If the saw follows the line, we're good. If it appears to pull to one side or the other, a little sharpening stone on the toothline will adjust that. This time things turned out just right. No stoning necessary. Now would be the moment of real truth. Would the miter box give me accurate cuts? or would more adjustments be required? I grabbed a piece of cherry scrap and gave it a shot. 90 degree cut checked out perfect. No light creeping under the trisquare blade when it was checked. Encouraging, but what about 45 degree miters. According to my miter square. Accurate as can be. I'm a happy boy! There is only one more thing I'm curious about with this saw. It's a little steel disk with three holes. It was attached to the back of the saw when I bought it. It has two beveled screw holes flanking a threaded center hole. In doing some research on this saw I downloaded a Stanley Tool Catalog from 1914 from a site called Rose Antique Tools. The part is listed as 109 a Stock Guide Plate. And in the direct picture of the saw box, you can see it in use. It's obviously an attachment to set a repeatable cut for length. I just don't understand for sure how the Stock Guide works in conjunction with it. I wonder if the stock guides I had made up should have one with an oblong slot down the center. After that it's getting another thumb screw made. I'm not sure I'm ready to go through all of that, but it would be cool to know. I've looked around some and not found any reference or seen any pictures of this part in use in the wild, and I'd like to know how it works. If you have one, or some good pictures of one, maybe you'll consider sharing them with me. 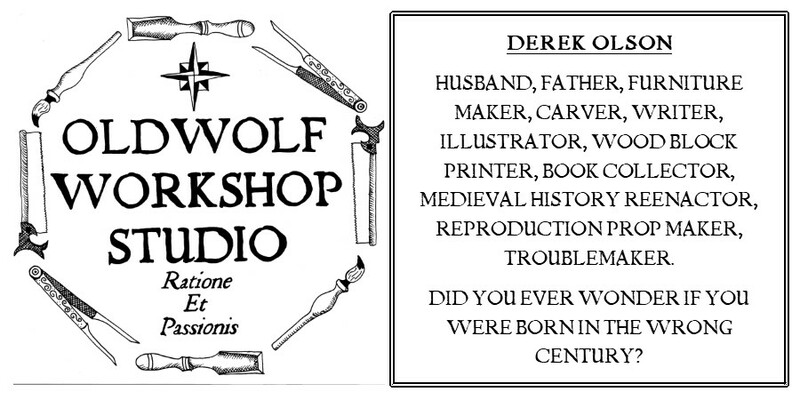 Please drop me a line at oldwolfworkshop@gmail.com so I can share that information here. I'd appreciate it. Either way, I'm calling this done (at least for a while) Old tool rehabs like this are fun distractions, but I am always happier when I'm done with them and can get back to making saw dust. There is a certain satisfaction in making sawdust with a tool you've saved from the scrap heap, and there is no better way to get to know and understand a tool intimately. In the end I'd rather spend time fussing with wood instead of fussing with tools. I don't know anything about the stock guide plates, but look at #106 and #107, seems like they should be related...going by their names. Thanks Toby, I've seen a lot of these and have them downloaded on my laptop and iPad, They are what got me in the vicinity of understanding how it works. I'm still hoping someone will help turn up a picture of the doohicky in practice. I'm pretty sure I understand it, but seeing it in practical use would help. I think the rehab looks amazing. I wish I could lay my hands on a decent miter. But that aint going to happen here in Thailand, and shipping would cost me a fortune. While this was a fun thing to rehab, and because I have it, it will see some use in the shop. I don't believe this to be a vital workshop apparatus at all. 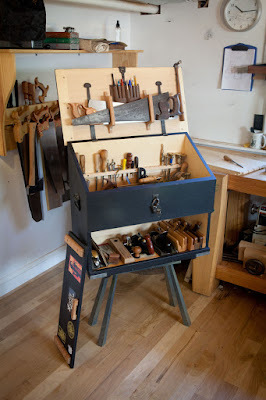 I've happily sawn crosscuts and miters for several years without needing one of these, and unless I have a series of them to do, I will probably continue to just grab a saw and cut them myself. I wouldn't have this one if I hadn't found it for less that $30 and the fact that I was looking for a small thing like this to tide me through the really cold part of winter where I can't get to my shop. I am refurbishing a similar miter saw. I need to remove the degree indicator plate before de-rusting the base. How do I remove the brass pins that hold the plate in place without doing the plate too much damage? Sorry for the delay I had in approving your comment/question. I did not remove the plate to scrub the rust away, so I'm not completely sure how I would go about the job. I suppose one could drill out the pins. or get a very fine punch. Good fortunes with renewing the miter saw. Wish I could have been more help. Q: How do I remove the brass pins that hold the plate in place without doing the plate too much damage? A: If the pins have high pitched threads (ie, they are not conventional rivets), use a punch and a small hammer. That's the way I've removed the plates on my Stanley MB 358 and two 1950's Craftsman 113.27520 Table Saws. All three have had pins with high pitched threads and came out easily. Place the item on a firm surface with the plate face down. Gently back the pins out a little at a time with a punch and a small hammer. Punch them until the pin bottoms are even with the bottom surface. The pins unscrew themselves as they're being punched out. Flip the item over and use a small nail puller to gently ease the pins out the rest of the way. Do not position the puller in a manner that will damage the plate. The plates, pins and threads were undamaged in this process and were easily re-installed securely using a small hammer and TLC. Does anyone have a hard copy of the parts list or a manual for the 358? The "tooltrip.com" url times out whenever I try to navigate to it. Any help is appreciated!